If you’ve just gotten your first french press coffee maker or maybe your dusting off an old gift for the first time in years then you should know that it’s capable of producing some of the best coffee you can find anywhere. So long as you use good coffee and follow basic principals in preparation the resulting coffee simply can’t easily be beat. Over the last few days I’ve covered a few basic topics on french press coffee preparation. If you are new to using a french press then these articles may be good for you to read. I’ve covered the water temperature, the amount of coffee you should use, and how to keep your french press clean (without making a kitchen mess). In this post I’ll cover the kind of coffee that’s best for French Press coffee makers. What Type Of Coffee Should You Use in a Coffee Press? To be brief – You can use any coffee roast you want in a french press coffee maker. The best coffee roast for french press is what you already have on hand or what you already like for the standard drip method. Organic coffee tends to be better and the coffee beans should be freshly roasted, preferably between 3 and 10 ago. The only other main consideration you need to have has to do with the grind of you coffee you use. If you use pre-ground coffee it will not taste fresh and the fine particulate will muck up your coffee as it passes through the french press filter. Coarse ground coffee will be best. If you are looking for the best pre-ground coffee for french press then you can start with something like this from the Coffee Fool or this from Gevalia. If you really don’t want to grind the coffee beans yourself you can find a more substantial list of fresh organic coarse ground coffee here. What About Regular Pre-Ground Coffee? If you want to just use the regular old Folgers pre-ground coffee in your french press than you’ll do just fine… except your coffee will not taste anywhere as good as it could taste and you’ll have a lot of sediment in your cup too. When you use pre-ground coffee grind your coffee will always be a bit stale because its packaging date has long passes and the sediment in the bottom of your cup will make it taste overly strong and a bitter. Even still this option may be better than using your old drip coffee maker. If you are open to spending a bit of money there are some dual filter french presses like the Espro Press P5 that are pretty good at getting as many fines out of your coffee as possible which may make those pre-ground coffees taste a bit better. Pre-ground coffee (no matter how fancy) tastes no where near as fresh as bean you grind yourself. Even if you keep the coffee in a vacuum-sealed canister it’s still going to be a bit stale tasting compared to home ground beans. The grind size is also a bit too small to make a good cup. 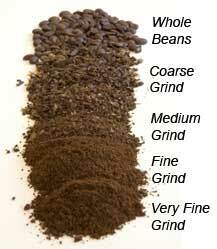 In fact the grind size is actually the biggest problem with using pre-ground mass-produced coffees. They are all ground for use in traditional drip-coffee makers. These grinds are usually sized medium to fine because almost all drip machines use paper filters and certainly most average coffee drinkers make their coffee with a drip filter. The picture to the left (src: Acorn Advisors) shows an excellent illustration of this size in comparison to coarse ground coffee beans. In a French Press the grind needs to be a bit bigger so that it is less likely to squeeze through the holes in the press. You can obviously look for major brands that use coarser grinds but they are hard to find. Even on Amazon the pickin’s are slim. Your best bet for convenience is to buy beans at your local grocery store and grind them there. The machine in the coffee isle will have settings for you to use that allow you to choose coarse grind vs fine and everything in between. Other alternatives for those who don’t like to get their hands dirty with the grinding process is to go to a local coffee house and have them grind it for you. Let them know you need it coarse and that you’ll be using it in a french press. The total DIY option however can be best and it’s the method anyone with a french press should be using anyway. In my opinion there’s little reason to use a french press if you don’t care enough about the process to do it yourself. Because grinding the beans yourself in your kitchen gives you the best taste possible in your coffee – and why else would you be using a french press unless you wanted the best tasting coffee possible? Grinding the bean yourself brings up needs for equipment and in some cases this might be the reason why you’re not doing it yourself because there is cheap equipment (blade grinders) and expensive equipment (burr grinders) and the expensive equipment is what you want. It’s what the market and coffee shop use and it’s what you should be using too. You can read more about this on this post: Manual Burr Grinder vs Electric: Which is Best? Again, you can use a blade grinder just fine. It will work for you and will be much better than using pre-ground Colombian, Folgers, or Yuban (just to name a few) but the blade will give you an inconsistent grind size (photo src: CasaBrew.com). Some particles will be big while others are small and many of the smallest particles will slip through your presses screen filter giving you way more sediment in your coffee than you might care for. The sediment may also make your coffee a bit string or bitter too. It’s not the way to go. If you have a burr grinder great. Use it. In fact use it every morning. Don’t grind a ton of beans at home and then work your way through it over the coarse of the next couple weeks. Grind enough for that day and then use it immediately. Set it to a coarse grind setting and make as much coffee with that as you can. Looking for the right type of coffee bean or roast? Keep in mind that it all works just fine. Whatever your tastes are will be fine for the French Press. The only real issue with the press pot is the size of the grind. In the coming weeks I’ll have a list of good (and affordable) burr grinders to put up on this site. You can check back for that when the post goes live. For those not wanting to wait take a look at one of the cheapest burr grinder for sale on Amazon and then compare that grinder with a few of the more expensive options. You’ll find that that one performs as well as all the other expensive grinders… so long as you have the time and muscle to use it every morning. What is the Best Coffee Grinder you can Buy? 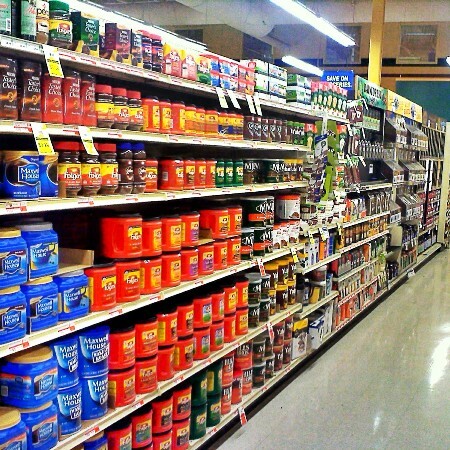 In the mean time however consider heading down to your local supermarket and keep it simple at first. Buy small batches of coffee beans whole and have the store grind them coarse for you. Try it. You’ll like it and you won’t have to make that big investment in home burr grinders just yet.